I'm so looking forward to some final festive fun this weekend. My Jacob is off work so that means Christmas Jammies, Cookies, and snuggles with our Axl Boy! On Monday, I shared how I DIY'ed our Christmas Card using PicMonkey (which is my FAVE by the way) and today i'm here to share how I made mailing 100 + cards out 100000 times easier! Having everything you need in one easy little box makes moving from space to space addressing your cards a BREEZE! Or even if you want to do some of them now, and some of them later, you can simply do what you want, then throw the rest in the box to get the clutter out of site. Plus, its nice to have all your card essentials in one place! Start with a box. It doesn't need to have little handles like mine, but if it does, it sure makes things easier for you! I picked this up a Targets Dollar Spot a few years ago. Then you just need to add your essentials. Not pictured (i.e...under all this crap) is my spreadsheet with names & addresses. I'm an excel nerd so I keep everything that way so its easy for me to mark off when i'm done! 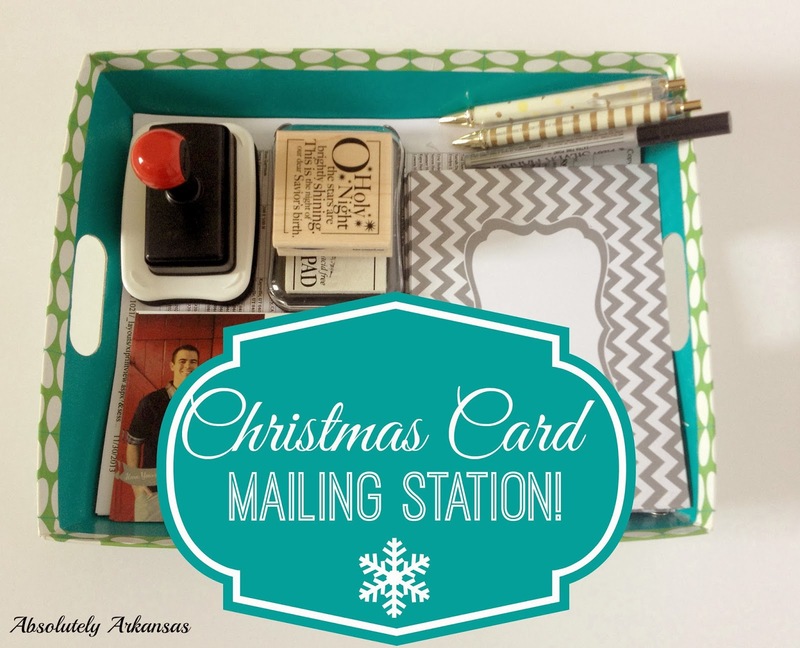 I also added cute envelopes, some pens for addressing, our address stamp + ink pad, and stamps! I didn't do anything fancy when addressing. I just used a pretty silver pen and called it a day. But I sure do LOVE our address stamp :) It makes it so much easier to put a return on all the stationary we send out! Having everything in a box was perfect for me, because that meant that I could place it on my lap (under a blanket of course!) and enjoy this weeks episode of Greys Anatomy while stamping the final envelopes. 3 cheers for laziness at its finest! I forgot to share with you how darn cute these little envelope seals were. And they were SO affordable on VistaPrint! I will seriously buy all my stationary needs forever from VP now! Thats about it, folks. Make sure you come back for our CHRISTMAS HOME LINK UP tomorrow! Share you idea's and bask in the glory that is this beautiful season!! Your envelopes are way too cute!! Also, where did you get your address stamp? I have been searching Etsy like crazy and haven't found anything I absolutely love yet. Thanks for your help!